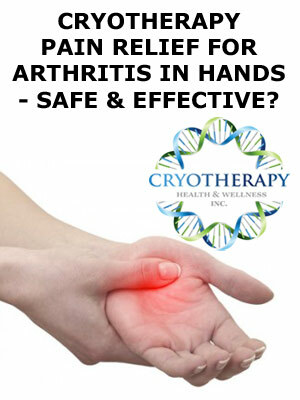 Home / Pain Relief / Rheumatic Diseases / Cryotherapy Pain Relief For Arthritis in Hands – Safe And Effective? Given its prevalence, it would seem that finding safe and effective pain relief for arthritis would be very easy. However, arthritis is a tough condition to treat. Every person is different, and so is their level of pain and discomfort. Medications both prescription and over-the- counter are the most common answers to the question of how to treat arthritis, but they can be riddled with side effects and contraindications that make their uses less appealing. The hands are an even more challenging part of the body to treat when affected with arthritis. Not only are they arguably the most abundantly used part of the body – because of the extreme number of nerves and sensors in the hands, pain here can be more pronounced than in other parts of the body. One potential solution is Whole Body Cryotherapy, a technology that was developed specifically for rheumatoid arthritis treatment and other conditions affecting the joints and the muscles including osteoarthritis and osteoporosis. It employs a supercharged version of cold therapy, a long standing solution for short term discomfort and pain relief. In fact, cryotherapy for pain management is becoming incredibly popular, with world-class athletes employing the technology to recuperate from sports injuries and to decrease recovery time. However, cryotherapy’s use in pain relief for arthritis in hands and other body parts is becoming much more popular as well. Most commonly, cryotherapy consists of a whole body treatment in a special sauna or a chamber. Liquid nitrogen is pumped into the sauna which rapidly decreases the skin’s surface temperature. This process prompts a whole host of physiological changes in a short period of time, leading to detoxification, improved circulatory function and the stimulation of the body’s immune processes which can promote prompt internal healing. These combined effects are what make Whole Body Cryotherapy an effective tool for arthritis pain management as it reduces swelling and inflammation and can lead to less pain when used properly. For those suffering from discomfort throughout the body, pain relief for arthritis can be achieved with the use of cryotherapy. The hands are a particularly unique case however, and while some joint pain causes in other parts of the body can be mitigated with rest and a cease in use, the hands are almost in constant motion. Typing, gesturing and common everyday tasks can become abundantly more painful. Cryotherapy offers a unique solution in this regard for the delicate hands as well, with a location specific treatment option. Utilizing a pen-like device that is targeted into the affected area of the hands, liquid gas cools the area surrounding it, blocking pain sensors and nearly putting pain sensing nerves into a hibernation like state. The results are almost immediate and recipients experience almost instant pain relief for arthritis symptoms. You can read about the difference between a localized and a Whole Body Cryotherapy treatments here. While you would need to visit your doctor to obtain a localized arthritis in hands treatment using a hand-held cryo device, you can enjoy the many benefits of a whole body treatment at your convenience by booking a quick treatment session in our ultra-comfortable one person cryosauna! It looks similar to a hot tub, so your shoulders and head are above the cold steam. What this tells us is that cold therapy for arthritis sufferers can be an incredibly overlooked option for pain relief. But, is it safe? Absolutely. Whole Body Cryotherapy side effects are almost zero when the cryosauna is used properly by healthy individuals without existing health conditions like those of the heart or the kidneys. Because the environment is controlled, the risk of tissue damage is eliminated as treatment lasts only long enough to be effective without being harmful. The practice was developed for muscle and joint pain relief, and for those with arthritis, particularly in the sensitive areas of the hands, both localized and Whole Body Cryotherapy can be safe and effective alternate treatment methods. Pain relief for arthritis in hands is possible, and those affected may want to consider taking the soothing effects of an ice pack to an entirely new and exciting level.